Roofing Contractor Forms, Custom Printed Roofing Forms, Downloadable PDF Roofing Forms ... Legal Versions Available for EACH OF THE 50 STATES! - 2019 versions available now! EVERY STATE HAS DIFFERENT REQUIREMENTS. USE A, "GENERIC" ONE-SIZE FITS ALL FORM AND YOU WILL JEOPARDIZE YOUR BUSINESS AND MAY BE DOING THE JOB FOR FREE! THAT IS WHY WE HAVE DIFFERENT VERSIONS FOR EACH STATE TO MEET EACH STATE'S LAWS. All PRINTED forms come in 2 OR 3 part carbonless, custom printed with your company information placed on each form. Easy to use, comprehensive, custom printed forms. These forms are are designed by experienced Roofing contractors for the needs of the roofing trade and are reviewed by construction attorneys. All of these forms are designed to work together to improve your image with the customer, help eliminate legal hassles, and to help you get more of the jobs you bid on. ACT will let our forms speak for themselves. Follow the links below to see samples and scroll down to get pricing. Available in state legal versions for CALIFORNIA, PENNSYLVANIA, NEW YORK, NEVADA, FLORIDA, LOUISIANA, TEXAS, OREGON, WASHINGTON and also for EACH OF THE OTHER 50 STATES, complies with the very latest laws (2019). Whenever state law changes, we immediately update our forms so you will always get the most current forms possible. Trade Specific for Roofing Contractors! We also have forms for other trades. Just Ask! Roofing Contracts, Roofing Subcontracts & Roofing Insurance Forms... When ordering, specify your state. These are not "generic". We have Versions that meet each specific state law! Residential Roofing Proposal/contract. This is a very basic form for simple jobs that is in a proposal /contract format. Sub-Contract. Very protective to you. Use it to sub out tear-off etc. you MUST have this form! Pre-Roofing Inspection- Use this form to educate the customer and eliminate problems! Change Order- Use for extra work, for change in specs, & for any other changes. Use this form and eliminate questions about money when it is time to get paid. Lien Contract Notice- California notice given with a contract that puts a lien (mortgage) on a persons house. Joint Control Agreement- agreement to be given to the control company to insure you are covered. Roofing Bid Proposal- The best selling tool any roofer will ever have! Roofing Inspection Photo Sheet- Add photos to your bid too point out problems and sell a lot more jobs. Job References- Organize your references and include as part of your bid package. Roofing Warranty Form. Use it in your bid presentation to help you sell more jobs! Roofing Warranty Certificate. (blue, green, red borders available) Same as WC1 except single page printed on certificate paper. Roof Certification. Certify a roof for lenders, home sellers/buyers & get paid nicely for it! This is the form that is making a lot of money for Roofing Contractors every day! Continuation Sheet- Use when you need more room to write than a particular form offers to continue that form. Letterhead- Matches the rest of our forms so you can present a unified image to the customer. Memorandum- Memo for notes, conversations to be confirmed, orders etc. TO ORDER call us 1-(800) 820-5656 or click on the Live Chat tabtto the right to order in a secure chat window with the help of one of our experts! 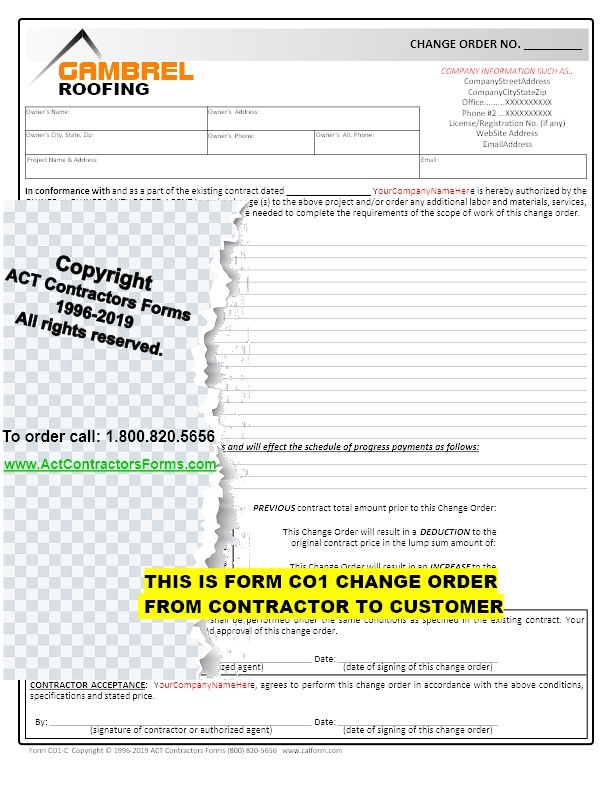 WANT THE POWER OF ACT CONTRACTORS FORMS SOFTWARE FOR ROOFING CONTRACTORS? ...In this tough, competitive economy... benefit from the competitive edge ACT Contractors Forms on Disk For Roofing Contractors Software gives you over your competition!